IA 300 Extra Heavy Duty. II 225 Medium Duty. For light commercial use. III 200 Light Duty. For household use. Heaviest of the types. Roughly about 50% heavier than a comparable aluminum ladder. Weight is sometimes a benefit; for example, it makes a stepladder more stable. If dry and clean, doesn’t conduct electricity. Simple repairs of treads possible locally. In the United States, wood ladders are usually made of clear southern Yellow Pine. Such defects as tight knots are not allowed because of the uncertainty they introduce regarding the strength of the wood. Giving a brand-new wood ladder a coat of clear polyurethane varnish may extend its life. Wood ladders should never be painted with pigmented paint, because paint can hide potentially fatal defects, such as a crack in a rail. A good conductor of electricity, so it is dangerous for electrical work. One advantage of buying from a major manufacturer is that they usually make replacement parts available online. non-conducting rails, so climber is not grounded by the ladder. Somewhat surprisingly, fiberglass ladders require more thoughtful maintenance than either of the other types. Sunlight is the enemy. Although they are manufactured with a protective, UV-absorbing coating, in time this coating weakens and should be renewed by coating the rails with a UV absorbent. Retain and follow the manufacturer’s directions. Strong and reliable, if regularly painted to prevent rust. Steel is used for fixed, vertical ladders, the kind seen on the sides of buildings, and for step stools with only a few treads. Usually sized by the height of the platform, in some cases by the number of steps, starting at 4 feet and even sizes proceeding in 2 foot intervals to 20 feet. A locking mechanism fixes the angle between the two pairs of rails. Since it is not safe to stand on the platform (or even the top rung), work can only be performed perhaps as high as two feet above the height of the ladder. Step ladders are made in one-sided and two-sided (also called twin or double-sided) versions, the difference being that the one-sided stepladder has rungs on only one pair of rails. Step ladder rungs are flat, not round, and generally about 3 inches wide. Most of the step ladders used in the home are one-sided. The cross pieces on the other side are not meant to support the user's weight and should not be used as rungs. Household step ladders often have a bucket shelf. Platform ladders resemble step ladders, except that the user is expected to stand on the platform. To make this safe, the rails extend beyond the platform and meet above it. Platform ladders are available in heights from 4 feet to 16 feet. Sometimes these ladders are sized by their height, but often by the height of the platform, which is typically about two feet lower. Extension ladders consist of telescoping sections. The rails of the top section (called the fly section) fit inside the rails of the bottom, or base, section. The fly section is held to the base section by brackets at the top of the base section. The fly section is usually pulled up by a rope; a ratcheting device that engages the rungs of the base section prevents the fly section from sliding back down when in use. Most extension ladders have two sections, but a few very long ladders (60 feet) have three sections. In the United States and Canada, extension ladders are sized by the sum of the lengths of the sections. Sizes of 2-section ladders begin at 16 feet (2 sections each 8 feet long) and progress in 4-foot increments to 48 feet. Because the sections must overlap, the maximum extended length of an extension ladder is less than its size. For example, a 24-foot extension ladder will consist of two sections each 12 feet long, but the maximum extended length will be 21 feet, because the sections overlap by no less than 1½ feet when the ladder is at maximum extension. The longer the sections, the greater the built-in overlap. As a result, the extended length of ladders 32′ and shorter is 3′ less than their size, of 36′ ladders 4′ shorter than its size, and of 40′, 44′, and 48′ ladders 5 feet shorter than their size. Standing on the top rung of an extension ladder is obviously foolhardy. For safety’s sake, the top rung should be no lower than the climber’s waist. In Europe, extension ladders are often sized by the number of sections times the number of rungs on each section, for example, “2×16”. The length of a section and the maximum extended length will be found in the manufacturer's specifications; differences between sizes vary from manufacturer to manufacturer. Extension ladders are intended to be used at an angle of 75.5 degrees, which is equivalent to the length of the ladder being 4 times the horizontal distance between the point of support and the foot of the ladder. A quick way of estimating whether a ladder has a proper slope is to stand with the toes of one’s shoes touching the rails of the ladder and extend the arms straight out, palms down. A rung of the ladder should touch the palms. If it touches the forearms, the ladder is too steep. The calculator below can be used to estimate the required extension ladder size. If the ladder's point of support is the edge of a roof, deck or other platform which a worker is going to climb out on from the ladder, the ladder must extend beyond the point of support by at least 3 feet (0.9 meter). will it rest against a roofline, eaves or a gutter, so the climber can get out on a roof? 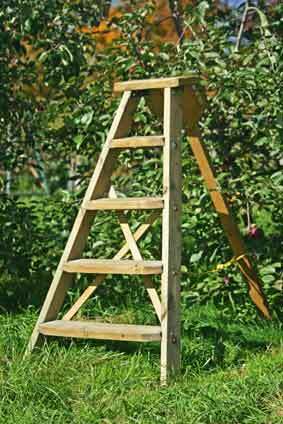 In orchards, a type of ladder is used whose stability on rough ground comes from having three instead of four feet. They are often called tripod ladders. The rails are not parallel, but flare toward the base to increase stability, while allowing a narrower top that fits among a tree's branches. The third foot is a pole hinged to the top of the ladder. This type of ladder is commercially available in heights from 4 to 16 feet. In use, the ladder is placed with the pole side facing the trunk of the tree, and the feet sunk into the earth. Unlike a stepladder, there is nothing to maintain the angle between the rails and pole. These ladders should never be used on hard surfaces; they will collapse. 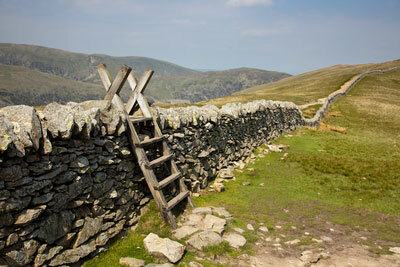 Another type of specialized ladder is the stile, which permits people but not animals to cross a fence. Notice the projecting rails to help the climber steady himself on top of the wall. Last revised: 9 March 2016.